So far summer is still clinging on. Was sunbathing yesterday and ended up with tan lines. Tanning, in Ireland, in September. Who would have thought it? So with this still sunny weather I still have the perfect excuse to get my legs out in the sun. These shorts are so comfortable. 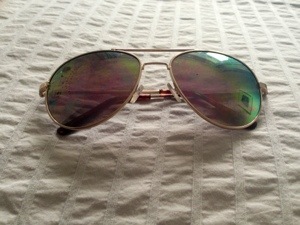 I got them in American Eagle in Chicago last year on Labor Day. American Eagle isn’t usually my kind of place as I’m not very preppy in style, but I picked up a few nice things that day so I suppose I should try it out more often. The top is Zara. Its a great top, I have it in cream too. You can’t see it but it has a lower back and hemline which I love. 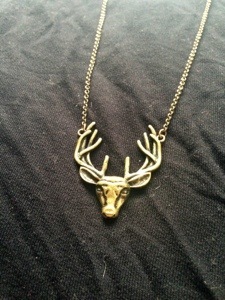 I love this necklace. I got it in Urban Outfitters years ago. Its just a really simple piece but I always catch people looking at it trying to figure out what it is. Its become quite old looking through the years, which I love. These pumps have been worn to death! Seriously. I’m surprised they’re still held together. They are from Topshop a few years back. I love them because I think leopard print is a great way to spice up an outfit and people rarely expect leopard print shoes. But they are also textured which is cool even if it does mean they shed a little. Finally, my sunglasses which are still getting some meaningful wear as opposed to just hiding hungover eyes on a rainy day. Ray Bans are such classic sunglasses and suit pretty much everyone. A definite essential in my eyes.